When I got a bottle of the new Bailey's with a hint of Caramel Irish Cream Liqueur, I knew that I wanted to bake something with it even before I tasted it. I had two reasons for this. First, I don't often have a full bottle of Bailey's sitting around, so it seemed to provide ample resources for creativity. Second, while I like the taste of Irish cream, I'm not that interested in having more than a few sips at a time. The creaminess of the liqueur is just too rich for me on its own, even over ice, in large doses. That being said, the Bailey's Caramel doesn't really taste like your typical Irish cream at all. Without sharing a drink with you (would that I could! ), I'll simply say that it tastes very similar to a caramel macchiato from Starbucks, albeit an alcoholic one. Caramel is such a versatile flavor that I couldn't initially decide what to do with it. Brownies came to mind, but somehow I ended up deciding to start with cheesecake. I have made plain cheesecake bars using my Baker's Edge pan before and they turned out so beautifully that there was no doubt in my mind I would have to use it again. I still think that the unusual design of the pan makes it perfect for anything that is likely to end up with overcooked edges and an undercooked center when baked in a normal pan, like cheesecake bars and brownies, in addition to whatever else you want to put in it. These bars turned out beautifully. I used quite a bit of Bailey's, so they are rather "grown up" and probably won't be a big hit with the kids, but they should be a big hit with the adults, especially if you like Bailey's to begin with. 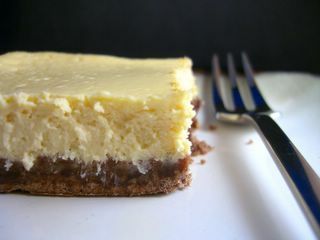 The cheesecake is creamy, with notes of caramel and Irish cream and the chocolaty crust provides a wonderful, shortbread-like contrast in texture. They're easy enough to make on a weeknight, fancy enough to serve at a dinner party and taste fantastic. What more could you want? Preheat oven to 350F. Lightly grease a Baker's Edge pan (or 9x13-inch baking pan). Begin by making the crust. In a large or extra-large bowl, cream together sugar and butter, until smooth and fluffy. Sift together flour, cocoa and salt in a small bowl. Working at a low speed, gradually beat in flour mixture. Mixture will be crumbly when all the flour has been incorporated. Press evenly into prepared pan and bake for 15-17 minutes. While the crust bakes, combine sugar, half & half, Bailey's and cream cheese in the bowl of a food processor and process until smooth. Add in eggs one at a time, waiting until each in incorporated to add the next, followed by flour and vanilla. Pour the filling over the hot crust when it has finished baking. Return pan to oven and bake for 22-26 minutes, until the filling is set (a 9x13 pan might need an extra couple of minutes, so be sure to test that the cheesecake is set by gently jiggling the pan before removing it from the oven). Cool completely before slicing (don't worry if the cheesecake appears to deflate as it cools), or refrigerate overnight. Note: Use full-fat cream cheese in this recipe, or substitute Neufchatel cheese to reduce the fat, but do not use whipped or fat free cream cheese.